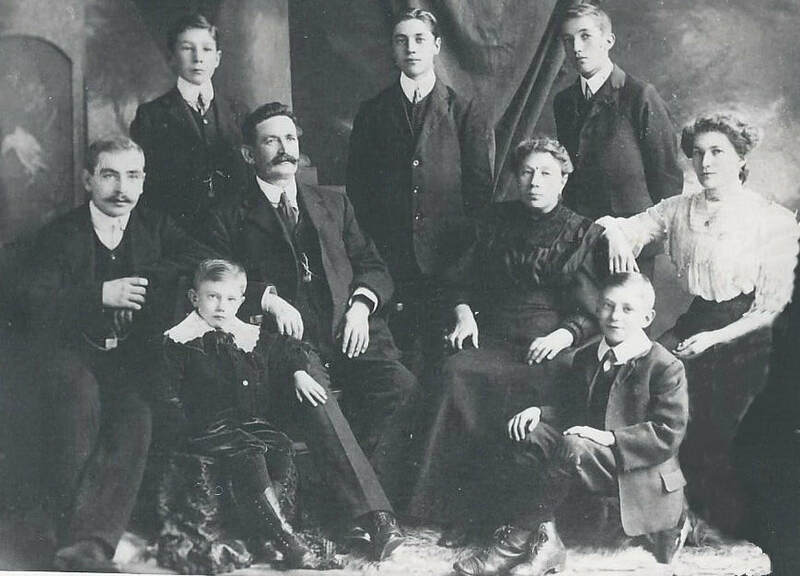 ​George Howard's parents George Arthur and Eliza and their two eldest children Sarah and Edward moved to New Road Croxley Green from High Wycombe c1890. Soon after their arrival Frank was born followed by George on 24th December 1892. Other siblings followed including Arthur Ernest and Fred. The growing family were known to have lived 45 New Road, one of a group of cottages called Cambridge Villas. Soon after the family had settled in the village the children would have attended the two local schools. George, his sister and brothers were pupils initially at Yorke Road and then at the age of seven the boys attended the older boys' school in the Watford Road just around the corner whilst Sarah continued at Yorke Road moving into the older girls' part of the school. George would have been taught at that time, firstly under Headmaster Mr. Alfred Walter Stratton-Hanes and then Neggie Wilson with Miss Stanford his assistant. On leaving school George worked at the John Dickinson Croxley paper mill as a Paper dryer. This is recorded in the 1911 census, with his father, brothers, and sister also working at the mill. ​It was soon after the outbreak of war in Europe in 1914 and when Britain had declared war with Germany on 4th August that volunteers were recruited to fight in France. 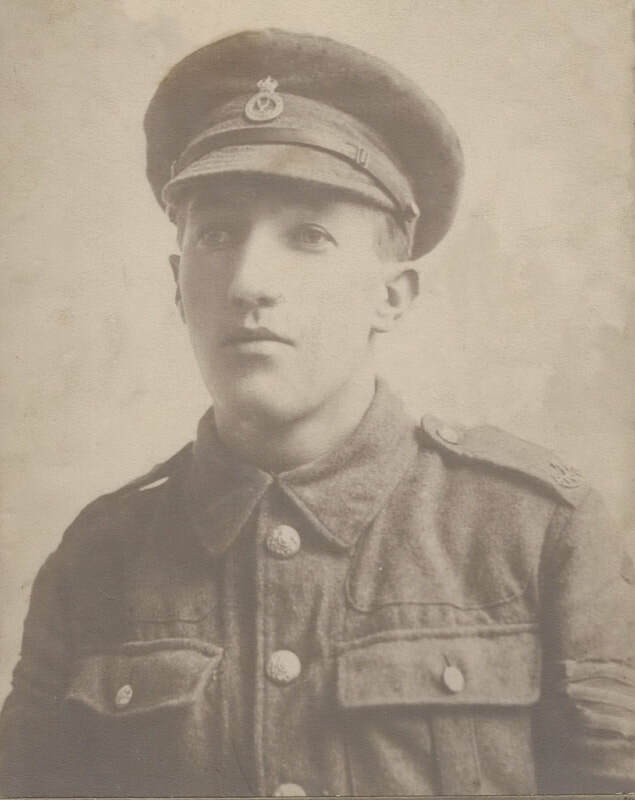 The family records mention that following a local Watford newspaper's drive in January 1915 for men to join up, George had enlisted and by 18th January joined the Herts Regiment 1st Battalion, No 3 Company, as Private 4553. 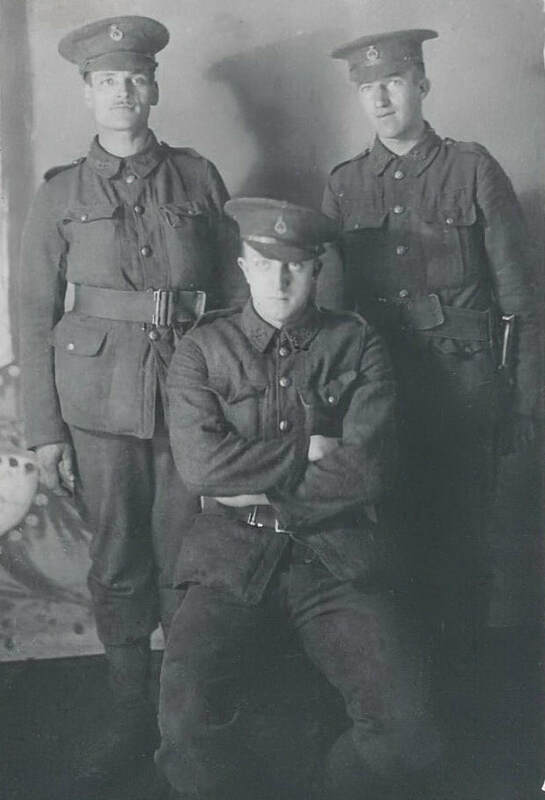 George's brothers Edward, Frank and Arthur also joined the army and served their country. © George's actual regimental badge. ​After six months training George was transferred to Western Europe on the 10th July. 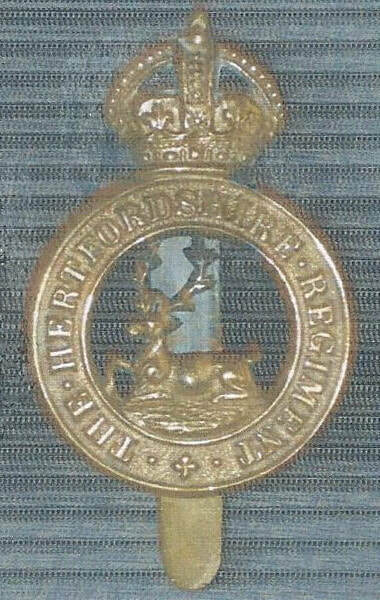 The Hertfordshire Regimental website records the 1st Battalion were an Infantry Regiment and fought in many battles including the Battle of Loos from 25th September – 8th October. It was the biggest British attack of 1915, and the first time that the British troops used poison gas as well as the first mass engagement of new army units. The French and British tried to break through the German defences in Artois and Champagne but despite improved methods, more ammunition and better equipment, the Franco-British attacks were contained by the German armies. Except for local losses of ground, British casualties at Loos were about twice as high as the German losses. ​The Regiment grew in size as the war progressed and George became a Sergeant and given a new service record number 266401. George continued with the regiment throughout the war until the renewed Somme offensive in 1918 when he was severely injured with the loss of one of his legs. 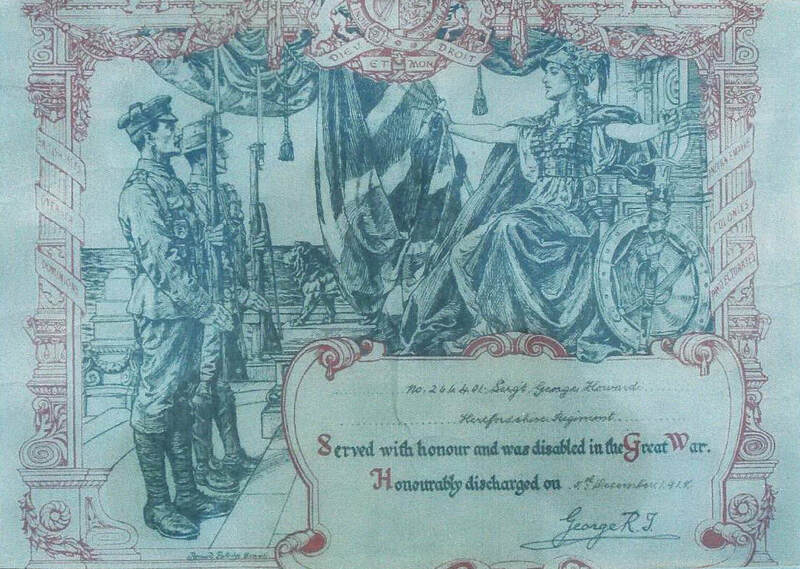 He was officially discharged on the 5th December 1918 and received a disability certificate acknowledged by King George V.
© George's Certificate he received to show and prove his disability. ​George returned to the village and continued to live with his parents at 45 New Road and a new experience coping with his disability. 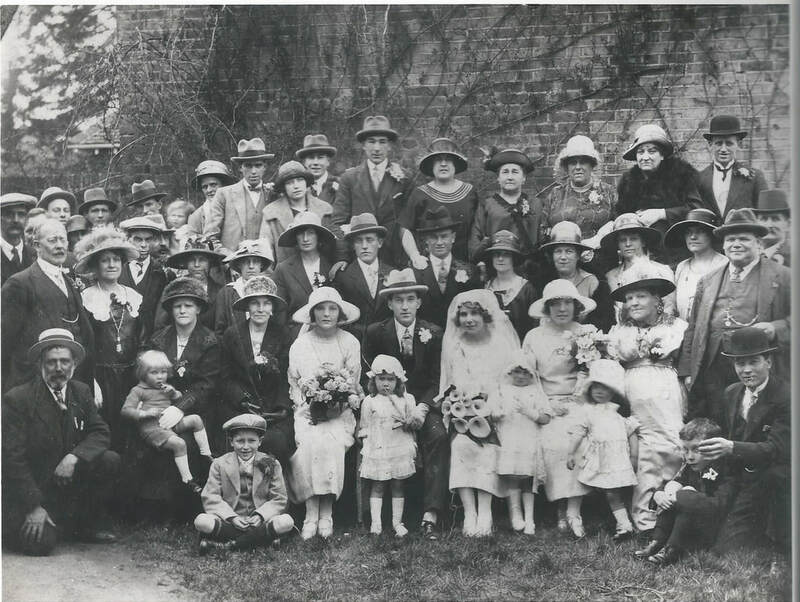 However, George married Susan Newberry on 19h April 1924 at All Saints church. Susan lived with her parents who were the publicans of the Duke of York in the Watford Road. Born 14th May 1899 whilst her family were living at 46 Preston Street, Hulme, Manchester, they moved south c1906 firstly to Norfolk Road and then c1911 to 66 Church Street Rickmansworth. © George and Susan's wedding day. ​After their marriage George and Susan lived at 22 Springfield Close, Croxley Green for many years. These were new houses that were built for occupation by 1926 and the couple were possibly new occupants soon after they were complete. They had 5 children John, Shirley, Ted (George), Evelyn, and Susan. 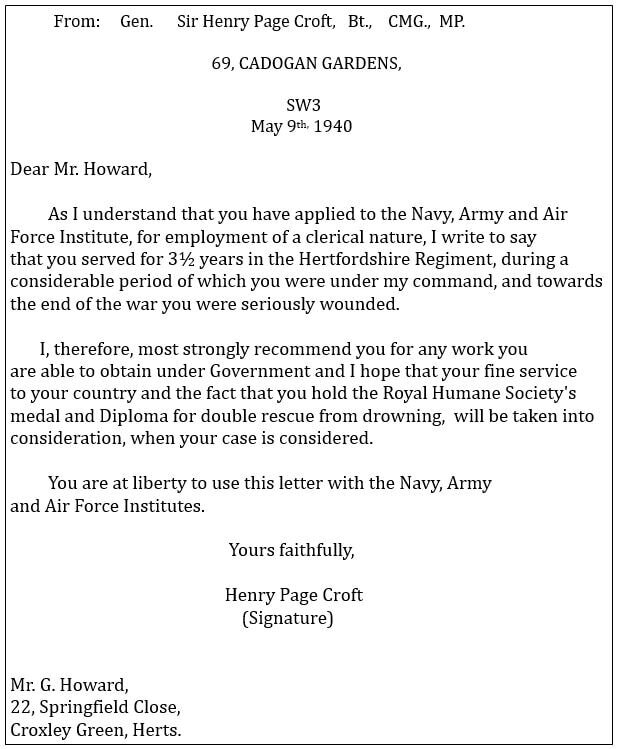 With the beginning of another war in Europe declared in 1939, George wrote to Sir Henry Page Croft, Under- Secretary of State for War (also a newly created Baron) to ask if he could be of service to him. 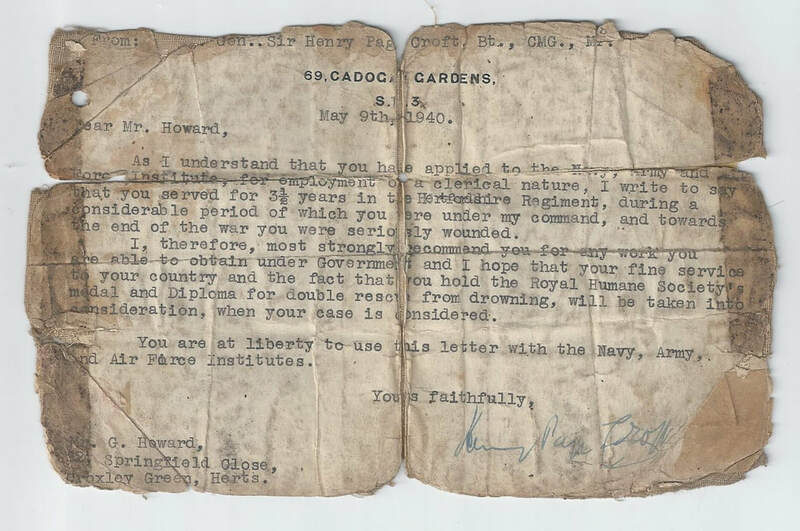 Sir Henry had been George's commanding officer in the early part of WW1. George received an acknowledgement recommending him to the armed services. ​George was now working as a successful dispatch clerk for the railway and with his letter of recognition and reference he became part of a selected team working for the London, Midland & Scottish Railway at The Grove mansion just outside Croxley Green, close by to Chandlers Cross. The mansion was used for secret war work that was known as 'Project X' and at that time it was the headquarters for the main four railway companies. When the Local Defence Volunteers was formed and eventually becoming the Home Guard, they would patrol The Grove and surrounding roads from dusk till dawn. After Dunkirk, when an attack seemed most likely, they began patrolling with loaded rifles. Luxury hotel, with golf and spa facilities. George and his family continued to make Croxley Green their home. He passed away in 1961 aged 68 years.